We weren't leet enough to get into the real Fours Head (you need 8 points in the boat, imagine!) but the Vet Fours on the Sunday was an acceptable substitute. The women, as I understand it, had a rigourous process of crew seleection and training; we menfolk had a somewhat more haphazard "OK, who's available then?" approach. But we were in tip-top condition after Ely. Simon the E was kind enough to trailer, so he got the leaving-at-6am-short-straw; I got to luxuriate in leaving-at-7. Bring back Ely! 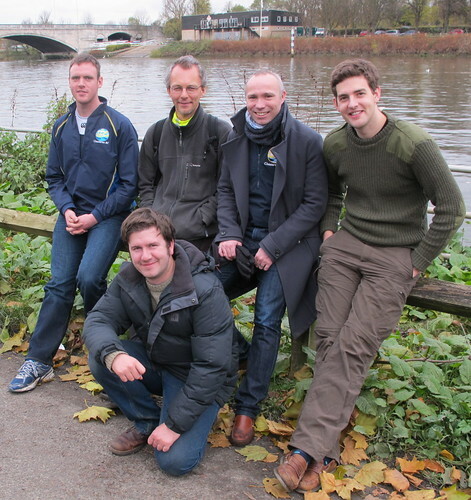 We all met up at Tideway Scullers (last there for Hammersmith Head in March 2010?). All the rigging stuff as ever, then we trundle off down the course - TSS is near the finish, which is good. And here we are during the race: me, Ian, Will, Paul, and that nice Mr Tidy. Photo credit Steven Andrews, who shouted what I assume was encouragement from Hammersmith Bridge. Notice decent separation at the catch. I don't recall all that much about the race: we went off at about 30 and stayed there; we went past 2 crews and one came past us - oh yes, with a little blade clash along the way, James doing an admirable job of shouting at the overtaking crew to get out of our way, with the confident tone with which he very nearly got away with "Caius! Which side of the river do you think you're on!" when he was on like totally the wrong side himself. Afterwards, it was time for a trip to the Ship on the far bank for a pint or two and sos-and-mashed-pots, where we met up with SA and Sarah, and rather noticeably didn't meet up with Katherine. Ahem. And here we all are with TSS and Chiswick bridge in the background. There are zillions of other photos on the facebook page. Should I link to them? Oh go on then, for posterity: ladies men men. Oh, results. You wanted results? Well. We fine manly chaps came 2nd of 4 in our class: 19:53.2, only 8 seconds behind York, who won. Hey ho, so it goes, though it would have been lovely to win on the Tideway. The ladies were 7th of 11 in their category in 23:35.4 .